The Boys volume 12: The Bloody Doors Off. Captain Swing and the Electrical Pirates. I've just uploaded the 50th issue of Wonderful Wooden Reasons. It's taken a long time to get to this point but it's been a laugh and I've got to hear lots of cool music and meet lots of cool people along the way. thank you all for your support and music. I hope you've enjoyed reading and found something good to listen to. here's to the next 50.
into which I write my reviews for Wonderful Wooden Reasons. I find I generally write easier with a pen and paper. i think the inability to constantly edit / delete / rewrite focuses me more and I generally am more productive that way. There is a drawback though. Typing the damn things up when the deadline is looming is a massive pain in the arse! I really don't dig typing at all. I'm ridiculously bad at it. I sometimes think I'd be more accurate if I used my forehead. Anyway, all being well and assuming I don't throw my keyboard in frustration, the new WWR will be online sometime tomorrow (Sunday). and then two glorious weeks of holidays. it's been a long term this one and my head is frazzled. I'm going to spend as much of the next fortnight as possible reading. maybe get some walks in, drink some booze, listen to some tunes, get a couple of issues of WWR online but mostly read. i have shelves full of unread novels and I'm going to give them a kicking this holiday and just escape into as many fictional places as i can possible fit into. there'll be the last actual issue of Wonderful Wooden Reasons for 2012 online this Sunday with a best of following a week later. going to make some additions to the zine next year. it's something I'm looking forward to and I hope you'll enjoy. there's a few things in the pipeline that'll be added in slowly through the year. the main priority though is regular monthly (at the very least), hopefully more often, issues. Just a quick fly-by message to let folks know that the new album from me (Ian) and Darren Tate called Tangletree is available now. You can find the usual limited edition (50 copies) signed and numbered physical version at the Quiet World website or for those of you who prefer their music in byte sized chunks it also available fro the Bandcamp site at the link below. 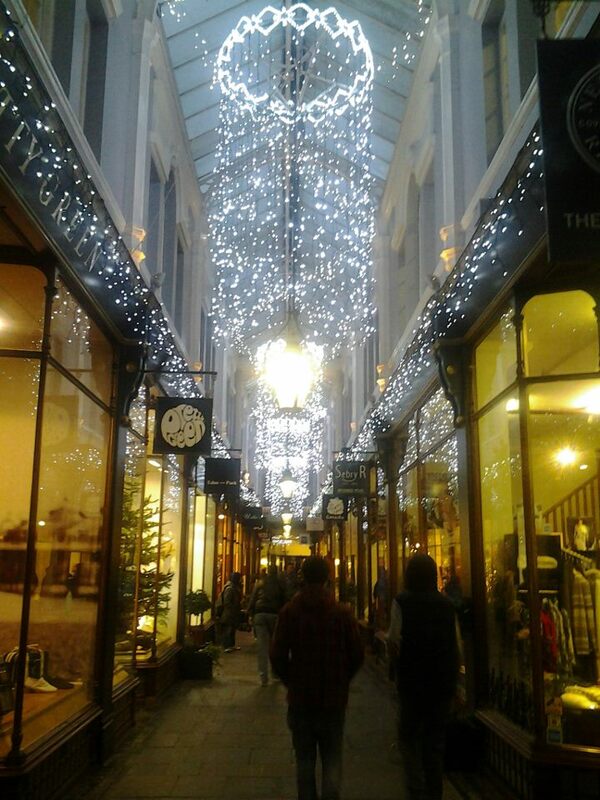 Went Xmas shopping in Cardiff today and managed to buy a present for my mother, a couple of stocking fillers for the nieces and a Carnacki book for me. It was pretty claustrophobic there and it got to me at times (I'm not a big fan of crowds) also my left shoe sprung a leak which wouldn't have been too bad except that it was pouring with rain for most of the day. The place was all trimmed up nice though and if it had been less wet would have been really xmassy. 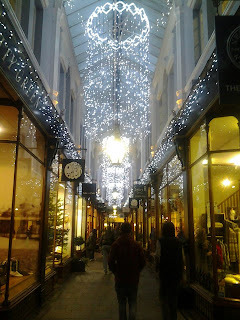 The photo is one of the shopping arcades. we missed the deadline for the carpark though and didn't have chance to grab any food before we left so we stopped off at a chain eatery on the way home. On the table behind me was a group of 4 young and ridiculously macho chav lads. For the most part their conversation revolved around how hard they are, how hard their brothers are, how hard their "crews" are and how soft everyone else is. This was all pretty tedious to have bellowed over the top of the terrible food I was eating. There were however two absolute gems that I think are worth sharing with you. "Cause you're holding your fork in your left hand"
"I don't like eggs in my omelette!" it takes all sorts I suppose. I'm home now and have just finished listening to the new Scott Walker album and now Desertshore by X-TG is having another airing. Today I spent several fairly long seeming hours (mostly because i really wanted to be home having a much needed lie-in) in compulsory drugs awareness training run by the police for the college. Apparently Swansea is a mephedrone and heroin riddled hellhole with a growing cocaine problem. it was a fairly downbeat start to the day that pretty much sucked all the colour out of it. am home now drinking Earl Grey and listening to Moljebka Pvlse wrapping the universe within their cosmic drone. Also, mine and Darren Tate's new album 'Tangletree' is out now and available via Quiet World. one of the unforseen side-effects of the last two years of work and course is that I've wrecked my neck. i don't have a desk as such. my work station is a shelf unit with my pc on top and my record deck and amp on the shelves underneath. my chair is an old (and very comfy) rocking chair that i've had for 20 odd years. it's a fairly neat little setup in that everything fits nicely on the unit but there is no legroom so the upshot is i have to do most things, like writing lessons or reviews or doing marking whilst leaning forward which has resulted in me putting a serious crick in my neck and it hurts just enough to be a fairly constant irritation. tonight though i've abandoned my computer and am stretched out on the floor with a book and some music for reviewing. i'm a bit too distracted for reading though, hence this blog about nothing, but the music is really hitting the spot. albums by TOC and John Huw Lewis have both wriggled past. very different from each other but both thoroughly enjoyable. i'm going to try and put one last Wonderful Wooden Reasons for the year online this weekend and both will be in it. I'm having a cup of coffee and a break from doing some xmas shopping (so far the only thing I've bought is a book for myself) and i thought i'd let you know about the next Quiet World release. I was hoping to have two new albums for you this month but due to my woeful proof reading skills i missed the typo on one of the sleeves. so that one has been pushed back to january but the other will be available on Monday. The album is called Tangletree and it's by me and Darren Tate. it was made a year or so ago and has been patiently waiting it's turn for release. it was done using an electric shruti box and samples from me and some particularly atonal guitar from Darren. they were never meant to go together but I spent one dark and damp night assembling them. it's one that should be played loud. your neighbours won't mind. It is Xmas after all. it's a couple of days later from the Esoteric Underground night in Carmarthen and I'm finally starting to feel human again. it was good fun. heard lots of cracking music and got to meet some new people. i made a mix for the night which you can hear here. the one part of the night i could have happily done without was the puncture on the way home. the wrench threaded when we tried to change the tyre and so had to ring the AA. it took 20 minutes for them to answer the phone and then another hour and a half for the breakdown van to get there. by then the two guys i was with had fallen asleep and i was going slowly mad from sitting there listening to the tick-tock and the on/off of the hazard lights. i am thankful though that the torrential rains of earlier had finished and that the heating in the car works because it was perishingly cold. for anyone in the area tonight (thursday 6th) come along to the Parrot in Carmarthen for an evening of Throbbing Gristle, Coil, Current 93, NWW, and loads more. yours truly will be playing some music at some point. should be fun. was woken up early monday morning (my day off) by workmen ripping the roof off of the house next door so Sioux (my partner) and I decided to go for a trip out to Carmarthen. For those of you who don't know the area Carmarthen is about an hour away (by car) from my home in Swansea. it's a large town with a nice mellow atmosphere which is a nice change from Swansea town centre which is pretty grim and somewhere I try to avoid. the other appeal of Carmarthen is there is a very fine record shop - The Tangled Parrot - whose owner, Matt, shares my taste for music that exists on the interesting side of life. once there he sneakily convinced me to part with the cost of the new Throbbing Gristle album. I probably should add that he did this without ever actually trying to sell it to me, he's that devious. I'm glad he is though, it's a fabulous album. picture TG fronted by Blixa Bargeld, Antony (without his Jonsons), Mark Almond (whose contribution is a perfect Coil imitation) & Cosi. The second disc is a thumping set of industrial stompers. it isn't of the level of sheer gonzo wonderfulness of 'After Cease to Exist' (which was one of the key listens in the genesis of my love of stranger music) but it is a fine way to spend your time. as usual there's an accompanying mix.